This page contains some general information on kayaking. For further information, please navigate to one of the sub pages. I have always enjoyed kayaking – I started out paddling on the Lode (a roman era waterway in Cambridgeshire, England) and the river Cam (which gives Cambridge its name). I moved on to sea kayaking which is just the most wonderful experience, you can just lose yourself in among the the waves, find yourself on deserted islands and meet strange creatures along the way. Every trip is an adventure in itself. In 2004 is spent several months kayaking down the east coast of Australia. I lived quite literally on a beach in Queensland for a number of years and spent many wonderful days out on the water.In 2009 I canoed along the Caledonian Canal in the highlands. I attempted to kayak from Land’s End to John o’ Groats in the summer of 2010. Photographs from my 2013 solo kayak trip from Penzance to Charmouth. Photographs from my 2010 solo kayak trip from Lands End to John o Groats. 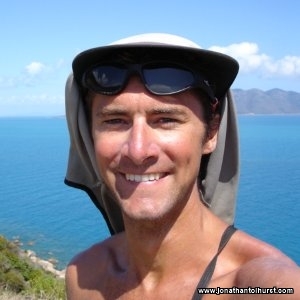 Photographs from my 2004 solo kayak trip down the east coast of Australia. This quiz will test your knowledge of the UK coastline! This quiz is designed to test your knowledge of the UK coastline. What is the most Westerly point of England? Land's End is the extreme south-westerly point of the British mainland, and the extreme westerly point of the mainland of England. Which port experiences the largest tidal range in the UK? The Bristol Channel, between England and Wales, regularly experiences tidal ranges of up to 14 metres. The tidal range at Avonmouth is not only the largest in the UK, it is the second largest in the world. Which is the highest point on the south coast of England? Golden Cap is the highest point on the south-coast of Great Britain. The 626 ft (191 m) hill is visible for tens of miles in each direction along the coastline. In which county is Durdle Door? Durdle Door is in Dorset. What kind of rock is the island of Lundy mainly composed? Lundy is a slab of granite sticking out of the Bristol channel. What name is given to the general lighthouse authority of England? The Corporation of Trinity House of Deptford Strond is the official General Lighthouse Authority for England, Wales and other British territorial waters (with the exception of Scotland, the Isle of Man, Northern Ireland). Which one of the following islands is connected to the mainland by a causeway at low tide? Lindisfarne is connected to the mainland by a causeway on which you can drive at low tide. Which of the following tide races is located under the original Severn crossing? Which of the following harbours was destroyed by a storm several centuries ago? Hartland was an important port until Tudor times when it was obliterated by a fierce storm. Cloey next the sea is no longer a port due to land reclamation. In which county is the Hinkley Point nuclear power station? Hinkley Point is a headland on the Bristol Channel coast of Somerset, England, five miles north of Bridgwater and five miles west of Burnham-on-Sea, close to the mouth of the River Parrett. The landscape of Hinkley Point is dominated by two nuclear power stations. Which south coast port did Sir Francis Chichester sail from on his epic solo circumnavigation of the world from West to East via the great capes.? On 27 August 1966 he sailed his ketch Gipsy Moth IV from Plymouth in the United Kingdom and returned there after 226 days of sailing on 28 May 1967, having circumnavigated the globe, with one stop (in Sydney, Australia). What type of boat is most synonymous with the west coast of Scotland? The Clyde puffer is essentially a type of small steamboat which provided a vital supply link around the west coast and Hebrides islands of Scotland. Which of the following is a famous whirlpool? The Gulf of Corryvreckan (from the Gaelic Coire Bhreacain meaning "cauldron of the speckled seas" or "cauldron of the plaid"), also called the Strait of Corryvreckan, is a narrow strait between the islands of Jura and Scarba, in Argyll and Bute, off the west coast of Scotland. In which county would you find the Sellafield nuclear facility? The sellafield nuclear facility is located at Seascale, Cumbria. Which of the following is the most northerly point of mainland Great Britain? Dunnet head is actually the most northerly point on the British mainland.